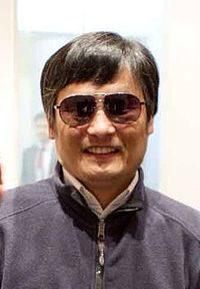 The arrival of Chen Guangcheng in the United States is significant on many levels but perhaps, lost in the narratives of triumph and political bravery is the fact that his blindness does not define him. This has been easy to overlook given dominant headlines characterizing him as “the blind human rights activist” or “the blind lawyer”. These are designations that sell stories but (as any successful blind person will tell you) probably have almost nothing to do with Chen Guangcheng’s life. Blindness is no more a defining marker of experience than hair color or height: it is a physical condition that ceases to be an impediment when you have the proper tools. We romanticize blindness by making it a larger obstacle than it really is. We let symbolism return us to an earlier time, an age when vision loss was considered a calamity equivalent to contracting tuberculosis. In the 19th century, both in Britain and the United States, blindness meant incarceration, segregation, poverty, and marginal schooling. Understood via this history, blindness lingers in the public’s imagination as steep and forbidding, and the capabilities of real blind people are thought to be profoundly limited. When Chen Guangcheng climbed a fence eluding his captors he was brave. But he simply did what all athletic blind people know how to do: he navigated. Blindness in no way inhibited his character, his skills, his ambition, or his intellect. He was heroic because he insisted on human rights. I am wishing Chen Guangcheng a life of simple physical nuisance, a life where his bravery is understood as human courage, democratic courage, not blind courage. I wish him the proper tools for study at New York University: full access to computers and websites, speedy and professional accommodations. Most of all I wish him deliverance from outmoded perceptions about his disability so he can go about the urgent business of being a leader without a 19th century ghost on his shoulder. Nira, you are one very admirable dog. Another example of someone who’s transcended her genre. I wanna know what dog biscuits you’re eating so I can send a box to the NY Times. Hi Bill: Thanks for your good words. My dog does all my writing of course. I’m just “the front” but it beats honest work. In truth, I tried to send this to the New York Times but got nowhere. The mainstream didn’t want the piece so I put it up this morning. I can take it, I’m a poet after all. Neglect is my middle name! You’re the best, man! Steve, Sometimes you piss me off. Every time I start to think I am a pretty damn good writer you go ahead and write yet another great post. Have often thought of you as the main stream press has botched this story royally.